The Gardens : Lot LG-210, Lower Ground Floor, The Gardens Mall,Mid valley City. Pavillion KL : Lot 1.18.1. Level 1, Pavilion Kuala lumpur. Tropicana City Mall : Lot G-16, Ground Floor, Jalan SS20/27, Petaling Jaya. Setia City Mall : UG-21, Setia City Mall, Bandar Setia Alam, Seksyen U13, Shah Alam. Plaza Gurney Penang : Lot 170-02-02, Plaza Gurney, Penang. Suria Sabah Mall : Lot G-68, Ground Floor, KK Sabah. Sushi Tei is giving away discount vouchers just by "Liking" Sushi Tei's Facebook page. 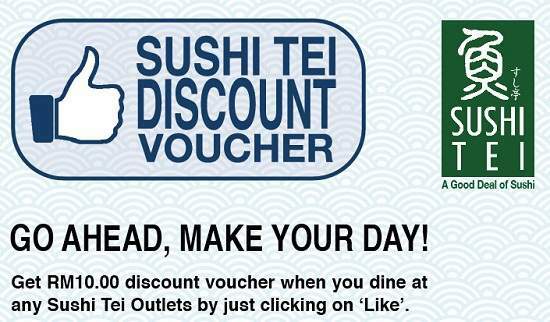 Just click LIKE on Sushi Tei's facebook page and you will be able to receive and print your own discount vouchers. For those of you who are already a Sushi Tei Fan on their Facebook, you will be able to enjoy this discount too!